I'm just wondering how secure commercial podcasts on itunes are protected against piracy? Does it even matter for security if the podcast is provided over itunes or is it the content provider himself who must make the proper security adjustments? The security must be provided by the content provider, though iTunes can access password-protected podcasts. The content provider sets up password protection via HTTP authorization and/or SSL encryption. It's then as secure as SSL, which is the standard for encryption on the Web, used by Websites for secure transactions, such as stores, credit cards, etc. See this link for more on setting it up. 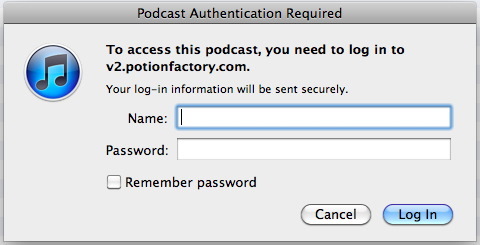 Apple says it does not list password-protected podcasts on the iTunes Store. Not the answer you're looking for? Browse other questions tagged itunes security podcasts drm .